An aircraft one doesn't see modeled that often and probably because here in the US, Italian planes run a distant third to those of the other Axis powers like Germany and Japan when it come to model builders. One of the reasons is that there just isn't the selection of available kits. This is true of the Fiat G.50 as much as anything else. The only reasonably available kit has been one put out by Secter of Japan. This has been boxed by Hasegawa and Pacific Models, with the latter adding all sorts of aftermarket goodies to their kits. 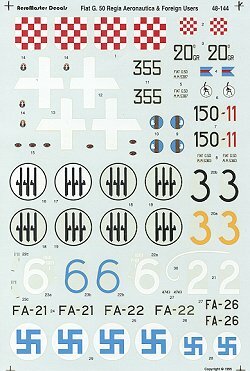 This sheet covers a number of different planes in Italian and other foreign service. First up is a Croatian AF plane from 1941. It is green over light blue with the usual Eastern Front markings on the fuselage and lower wing tips. 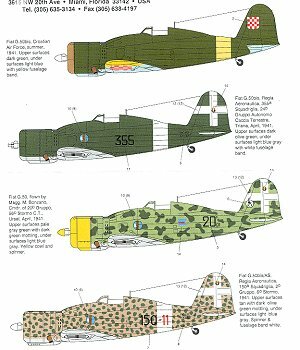 Next is an R.A. plane from the 355th Squadriglia. It is in Dark Green over light grey with a white fuselage band as carried by just about all Italian aircraft as it designated the Mediterranean Theater. Another Italian plane from the 20 Gruppo is this one with a Yellow cowling and camouflaged in light green with dark green mottling. Light blue grey undersides and no theater band. In a Sand with Dark Green Mottling camouflage scheme is this 150a Squadrigila aircraft. The next three are all from the Finnish AF, all with LeLv 26. White 2 is in the Finnish colors of Dark Green, Black over light blue. But it apparently has either replacement parts from a Sand/Dark Green mottle plane or it was rushed into combat before being totally repainted. Either way, it makes for something a bit different. 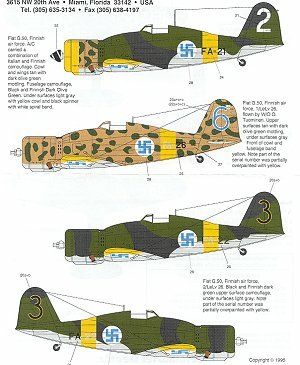 Blue 6 is in standard Italian colors, but with the yellow wing tips and fuselage band carried by Finnish planes. Finally, in a full Finnish scheme of Black and Dark Green over light blue is Black 3.